Ditto's shiny form appeared in Sinnoh. When the group were on the way to the Grand Festival, they soon discovered that something was impersonating their Pokémon. 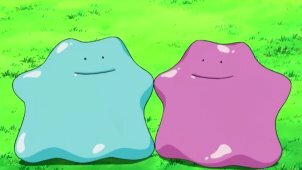 They quickly discovered that it was two Ditto, one of them shiny, under the control of Makina, a girl whom is dressing up as the Elite Four Member Flint. She owns both of the Ditto but fails to utilise strategy properly with them. The Shiny Ditto, nicknamed Number 2 was used in a battle against Ash's Infernape as well as Team Rocket. It has been known to transform into Piplup, Zapdos, Staraptor, Happiny, Sudowoodo, Meowth, Wobbuffet and Croagunk.